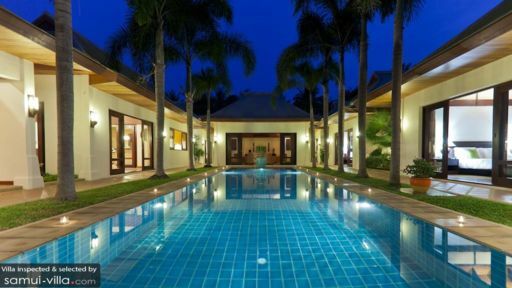 A stunning property in Ban Mae Nam, Villa Frangipani is the tropical paradise you have been dreaming of. 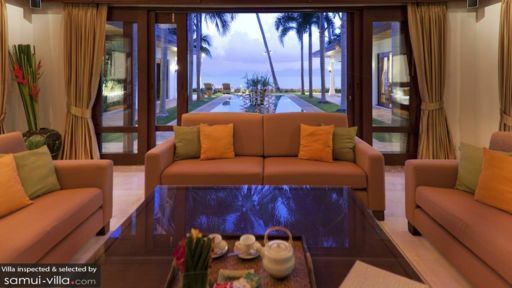 With five, air-conditioned bedrooms, elegant décor, traditional architecture, and not to forget the best view of the ocean, there is nothing you won’t get here at Villa Frangipani. A lavish swimming pool makes up the outdoors at the villa, and you will get a beautiful view from here. The living spaces have been designed in a manner that offer the best in comfort and so you can truly enjoy yourself on your tropical getaway. The villa features two individual bedroom pavilions, and while one of them houses three bedrooms, the other one holds the two remaining bedrooms. With wooden flooring and air-conditioning the bedrooms are the best in comfort and style. There are king-sized beds in two bedrooms and the other three boast of single beds to accommodate more people easily! Each bedroom is accompanied by a modern en-suite bathroom that has a bathtub and shower area. The rooms open outwards to the gardens and pool, so you can step out and enjoy the fresh breeze whenever you wish. Sit by the pool late at night, enjoy a few drinks, have a fun time with your pals and easily head to your rooms for a good night’s sleep! All you need for an exotic holiday is a beach bag, a swimsuit, a few pina coladas and water! 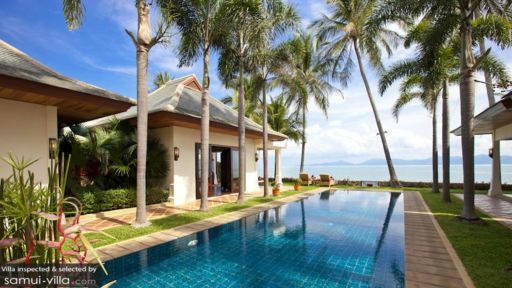 At Villa Frangipani, they pride themselves in offering a space which is conducive to just this kind of island fun here in Mae Nam beach! The 15-metre swimming pool glitters under the tropical sun and there are sun chairs for lounging after a swim. You can play water games or just dip your feet in as you enjoy the serenity of the neighboring areas. The quiet and calm of the island really relaxes the mind and leaves you with a refreshed and clear head! A unique blend of old and new forms the spacious and comfortable living area which is furnished with plush couches coupled with colorful and vibrant cushions for a cozy space that you can relax in. The living area is located on the pool’s edge, and through sliding glass doors, you can reach the pool. The timber roof is high-vaulted adding a luxurious and at the same time traditional ambiance around the room. Around the room, you will find several Thai artefacts and things as well as a flat-screen TV, fresh flowers as air-fresheners and other knick-knacks. The dining options are a plenty at Villa Frangipani, as there is both outdoor and indoor dining. The indoor dining area is a lavish spread with a ten-seater dining table beside glass doors that look out to the open sea. The outdoor dining area is housed under a roof with an open-plan structure, so you get to enjoy dining alfresco-style for a wonderful experience. The kitchen is fully-equipped and modern fitted with appliances and amenities or your use and ease. A dedicated team of employees is there to serve you happily and kindly. They are accommodating and will welcome you with warmth. The cleaning and maintenance is all taken care of by the staff. The beach beckons in the distance, so head on down and dig your toes in the sand as it is known to be a natural exfoliator for your skin. As you sunbathe on the peaceful shores of Bo Phut beach, feel relaxed and refreshed. The villas were of an exception level and very spacious. We were astonished how well prepared the food was and it was of a high level. Service was on par with a large hotel and staff were pleasant and helpful. Highly recommended and a reasonable price.